We’re whipping through the school year faster than a hot knife through butter, and the faster the time goes, the more unorganized I get with our weekly dinner routine. Sure, I make dinner, but sometimes our dinner is made up of two random side dishes that I made for blog posts and a pan of scrambled eggs. Thus is the life of a food blogger. Endlessly glamorous, I tell ya. Anyway, I’ve been trying to grab dinner by the reins and stock up on easy, large batch meals to keep in the fridge or freezer for when busy nights pop up. 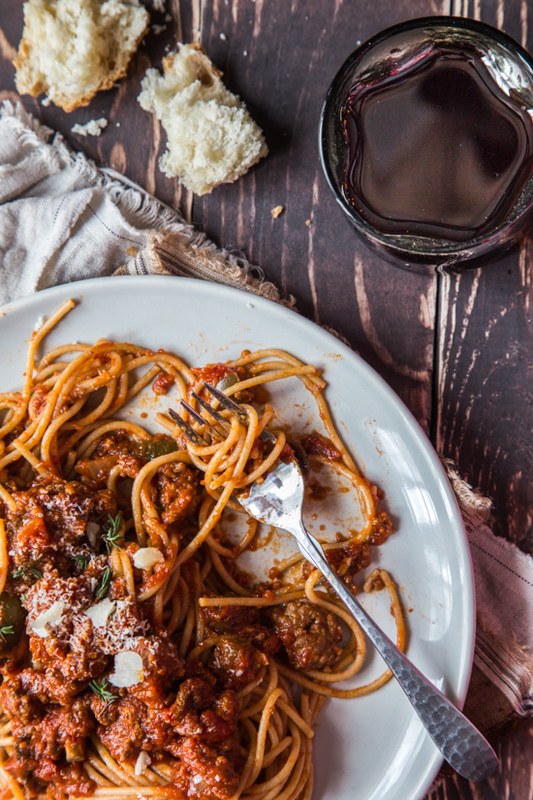 This Slow Cooker Meat Sauce is one of my absolute favorite dinners. Not to mention one of my family’s favorites, too. My chicken noodle soup is another all time fave, too. 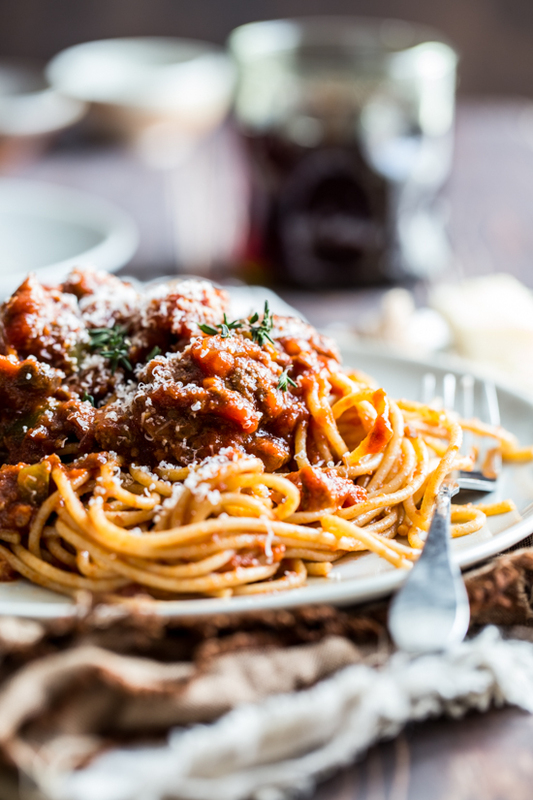 What I love about this slow cooker meat sauce is that with just a little bit of prep, all of the ingredients can be tossed in the crock pot to simmer the day away, without the need to babysit a giant pot of sauce on the stove. It’s hard to replicate the flavor of slow cooked sauce with a quick recipe. I’ll make a batch of this on the weekend and put some in my fridge for a couple of dinners during the week, and the rest in my freezer for quick dinners on unexpectedly busy nights. Which is a common occurrence around here. Last year, my husband bought me my new Hamilton Beach Programmable Slow Cooker. I used to have a dinky little thing that couldn’t handle big, make ahead dinners. Now with two kids and a crazy schedule the make ahead dinner is a necessity, I tell ya. My new cooker is big and programmable. And if you’re into cooking roasts in your slow cooker, this one has a probe thermometer that you can program it to cook to a specific temp and then switch to warm. Yeah, I’m not kidding. I need all the help in the planning department. I would be lost without it. Anyway, back to the sauce. My kids have gotten so obsessed with this recipe, that every time I say I’m going to make it, they start screaming, ‘meat sauce!!’. Okay, I admit that it sounds less cute here than it is in reality. But I think I’m a sucker for anytime my kiddos rave about food that I make them. I’ll take crazy ‘meat sauce’ chanting any day over whining and complaining about what’s on their plate. Luckily, I have more of the loving and less of the whining. 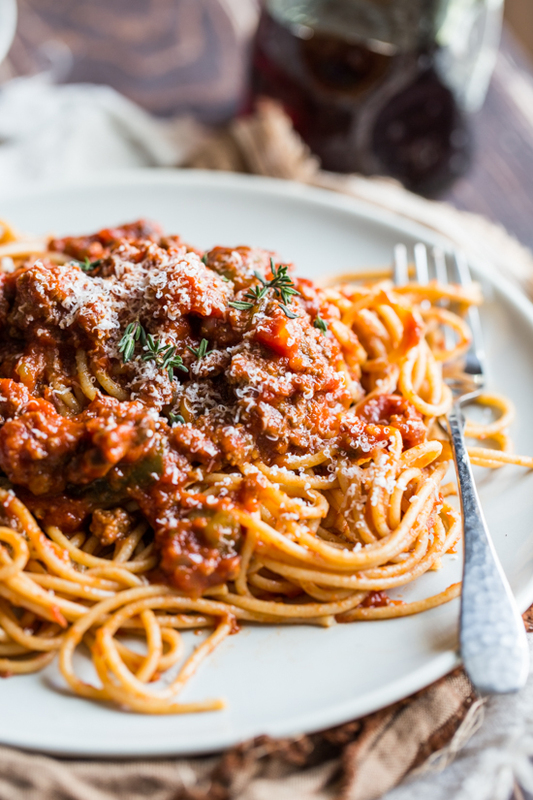 My slow cooker meat sauce is great over pasta or even on top of a baked potato. Serve it with crusty garlic bread or even tossed with pasta and cheese for a quick and easy baked pasta dish. Oh, yeah. Also, your house will smell ah-mazing. Just a little fyi. In a dutch oven or heavy bottomed pot set over medium/high heat, brown sausage and ground chuck. Remove from heat, drain excess fat, and transfer cooked sausage and beef to 6 quart slow cooker. Return Dutch Oven to stove. Heat olive oil over medium high heat. Add onions, peppers and garlic and cook, stirring frequently, until onions and peppers are soft and garlic is fragrant, about 5 minutes. Add mushrooms and cook for an additional 3-5 minutes. Transfer vegetable mixture to slow cooker. Add crushed tomatoes, tomato paste, wine, parmesan rind, thyme, salt, pepper and crushed red pepper flakes to slow cooker and stir to combine. Serve sauce over your favorite pasta, baked potatoes, garlic toast.